I’ve recently conducted an interview with a very creative individual who is active in the Amiga community. His name is Pascal Papara (phoenixkonsole on discussion forums) and he lives in Germany. Most people know him as the author of the AROS-distribution AEROS, but he’s also involved in many other projects. Could you please give us a short introduction about yourself? Hi Jonas! Sure! I’m 31 years old, the father of two children and a victim of a female house dragon. I am working as 3D Arrangement planner/-designer for a company producing power-plants (biomass and industrial waste heat). Many of us started out with Amiga’s in the 80’s and 90’s. When did you get your first Amiga and what kind of model was it? My first contact with the Amiga was back in 1989. My father took me with him to his co-worker and I was allowed to play Silkworm! : ) Yeah! After Silkworm I played through New Zealand Story. It was on an Amiga 500. My first own Amiga was also a used Amiga 500. This was in 1992. The day I convinced my Grandmother to by me an A1200 started as the best day of my life and ended in a tragedy. I was 11 years old. When we arrived at the Electronic Center they had no A1200s anymore and they told me that Commodore had died…. Wahhhhh!!!! It took me many a month to convince my Grandmother to buy me one…..
Back at home I powered it up and….. nothing.. I got a „press del for bios“. Damn… I hated this PC. Back at the Electronic Center i told the guy that this PC is broken. No, he told me I had to install MS-DOS first. ??? ….. whoot! Where is my Workbench? Where is my mouse? Waaaaahhhhh! Trauma 2.0. Back at the Electronic Center I told him that DOS was broken. Back at home and after installation I looked at the poor operating system…… Damn, I had no sound-card anyway…. horror… beep, beep, beep, I was happy that this thing didn’t explode. I was trapped…. ha.. I still had my Amiga 500 which was replaced by the 486DX2 when Windows 95 arrived. Prior to Windows 95 I just used my Amiga for everything. What are your best Amiga memories? Getting dozens of games and playing them all with my friends. Gaming was essential part of my life and still is. Why do you think the Amiga is still alive today, in 2015, 21 years since Commodore went bankrupt? Because Amiga impressed their users back than so much that it became part of our lives, our memories (also memories regarding people we may have lost meanwhile). It is about emotions and to be one of those „knowing“ that Amiga was so much better. If you could go back in to 1999-2000 and be the boss of Amiga Inc. what would you do to get the Amiga back on track again? Tough question. With the knowledge of today I would have tried to make AmigaOS available on other platforms as fast as possible and I would have reduced or canned development of own hardware. 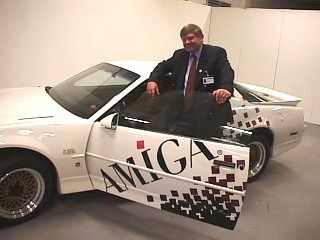 Other companies could develop and build Amiga’s under license. So the Risk of hardware-sales would have been outsourced. It is clear that the AROS operative system has come a long way since it first saw the light of day. We are now spoiled for choice between different distributions and hardware platforms, even the Raspberry Pi can used. Your AROS distribution, AEROS, is a hybrid of AROS and Linux and can be used on ARM and x86 systems. What does it mean that the OS is a hybrid or in other words, how does this work? AEROS is a hybrid distribution based on Debian Linux and AROS hosted (based on my native AROS distribution called Broadway). While Linux manages the hardware side and is booting at first, it boots straights into a AROS environment. It is important to understand that „hosted“ doesn’t mean „emulation“ which would imply speed losses. This is not the case. AROS hosted boots a AROS Kernel which is running as a sort of Linux process. Also AROS hosted has drivers for Video, Ethernet and Audio. The difference is that those drivers talk to Linux API’s and don’t control the real hardware (which would be the case of native AROS). Why using Linux as HOST OS? AROS hosted has drivers which just needs running sound, Ethernet and video drivers on the Linux side, independent of brand or type it will work as long Linux can drive it. So we can provide a single media with AROS which will work on 99% of PC’s and Notebooks available. Same is true for ARM devices. Each ARM device has its own hardware-combinations. If you look you will also see that you need for each device a own Debian or Ubuntu image..
AROS is developed by a hand full of developers… They can’t work on that that quickly. With AROS hosted, the Linux crowed does the driver work for us. Besides this it is fact that Linux drivers are more optimized and Linux can read virtually any filesystem, making it possible to access them from within AROS. What would you say are the advantages and disadvantages (if any) of such a hybrid system? There is no disadvantage from a user point of view. Some could argue that it is too big. AEROS is full of drivers for AMD, ATI and Intel, ALSA and OSS Soundsystem, WiFi, And full of Libre Office,Emulators and Browsers. The same amount on the Linux side as on the AROS side. So a pure version(with minimal Linux) could be done but then the benefit of having it working „good“ on multiple configurations would be gone. I’m not more interested in setting up my OS entirely alone. I like to have a all in one solution. If Linux is running underneath as you say, is it possible to run Linux games on AROS? How about STEAM? I’m sure some people are wondering about that. Yes you can run any Linux application such as Steam on AEROS. Linux applications can be „called“ from AROS side by a shell command called „lx“ . Typing in AROS shell „lx Firefox“ wold launch Firefox (i fit is installed). To access the Debian application menu you can use the task-bar on the bottom. Being a retro gamer myself I just have to ask.. can you run old Amiga games in AEROS? Does it have emulators for other platforms like NES, SNES, Mega Drive and so forth? AEROS 3.5 for x86(works only on hardware similar to ARES ONE) includes AROS 68k so you can run them out oft he box. AEROS 3.9 (USB-image which works on 99.9% of all PC’s) doesn’t include it but it comes with JanusUAE (AROS integration) and FS-UAE (linux)… you just need to add AROS68k or AmigaOS 3.x. AEROS 4.0 will offer easy installers for IcAROS, Broadway and AROS Vision. (Based on the indieGO!-Appstore). Together with our boot-menu you can get the whole dose AROS on a USB-stick. AEROS for Raspberry Pi can make use of AROS ROMS with UAE4all or Amiga ROMs with E-UAE. FS-UAE does compile but I had no time to check it out yet on the Pi2. In relation to AEROS you have started something you call Amigacoins and AmiCloud? Would you please elaborate on this? I have a sort of master-plan which contains a working infrastructure and streamlined support for developers. Also I am a fan of Communism (the theoretical idea not how it was done so far…. )… So, power to the masses. Amicoins (or indieCoins as I call them outside our Amiga-community) are not similar to Bitcoins or other virtual currencies. They are more like bonus-coins you can earn (by being a active member of the community) and of course buy with real money. Also, as some may know, I’m also selling AROS compatible computers at www.ares-shop.de and I use the earnings to donate to donations or to invest in AROS related developments. Now with Amicoins I can give the „decision“ how the money is used partially back to the customer. The customer can buy apps, music or videos at the indieGO!-Appstore or just donate them to his favorite developer. AmiCloud is an alternative to Dropbox. We will provide clients for AmigaOS, AROS, Linux, OS X, MorphOS and Windows. Like Dropbox you can synchronize your files between you computers and your cloud storage. The storage will be provides by us and unlike Dropbox their will be no traffic-limitation. Additionally to the syncing feature you will be able to share your files with the world as public „URL-link“. We will start very small and unlike Dropbox even the basic version costs a one-time fee. The cloud-size will grow. the more users we get. The Pro-Version will start at 79($ = Whatever € it is at that time) per year. It starts with 50GB and grows as well. We are still client-wise in alpha state.. I hope we will be ready before June. If there is enough interest we will enhance it function-wise. IndieGO!-Developers for example, will get the feature to create public links to their „free“ app store content. Are you spreading the word about AEROS in the Linux community as well? If yes, what has been the response so far? Not yet. I am member of the „open invention network“ and Linux users are aware of AEROS but i don’t promote it except with Google Adsense. I would like to finish Broadway 1.0 which is my native AROS distro and is basically the AROS face of AEROS. Then I will release AEROS 4.0 which will bring it Linux-wise and AROS wise to a leading position (feature wise ; ) – not user-wise).. In other words, I would like to polish things first and show it with all bells and whistles. The Broadway preview 1 will be available after the release of Amicloud. It is planned to have 3 more „previews“ each featuring on or more new „services“. What kind of plans do you have for AEROS in the future? Where do you see this OS in three-four years? AEROS allows me to use AROS and Linux and both allow me to form them as I like. I will focus on ARM because those boxes reached good performance at a very low price. I made a deal with the guys behind ExaGear to include it in the commercial AEROS version called „Premium“. It will be available at a reduced price for users oft the „Plus“ Version. ExaGear is a sort of QEMU-usermode emulation with slightly better performance allowing to execute x86 apps on ARM Linux. Such as Wine. 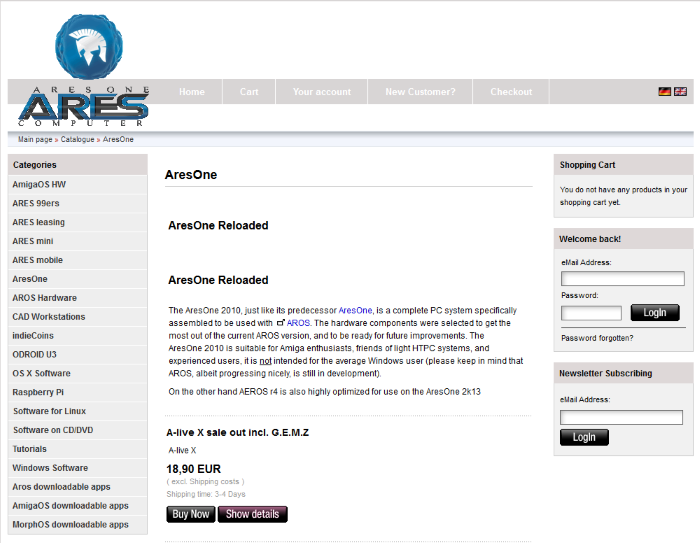 Beside the AEROS distribution you also have your own computer shop called ARES Computer. Could you please tell us a bit about this business? I still have the www.armigaone.de domain. So after a bit of thinking AROS-> ARES (i like greek mythology) AresOne was born. The idea was to work towards a reference AROS-compatible PC. After some cooperation with Stephen Jones (Imica, ClusterUK) and some community work had all drivers together. My intention is and was to earn a bit money for reinvesting in AROS projects while offering users a easy way to get a fully compatible system. Are you thinking of expanding this business in the future? The fact that AROS and Amiga activities are sidekicks gives us a bit freedom to do also thinks which seems un-logical and stupid from a economic point of view but i believe that we will gain step by step attention outside our community (5 years are gone quickly). All that again will be the base to finish our indieGO!-console project. Which again is AEROS. All in all I made no loss, but also only a small profit. Reason is I reinvest everything, hoping that the small snowball becomes a big avalanche. As far as I know there are no computers called Amiga being produced anymore. The closest we come is the AmigaOne range. I remember Commodore USA making a new Amiga computer a few years ago, but they suddenly disappeared from the market. 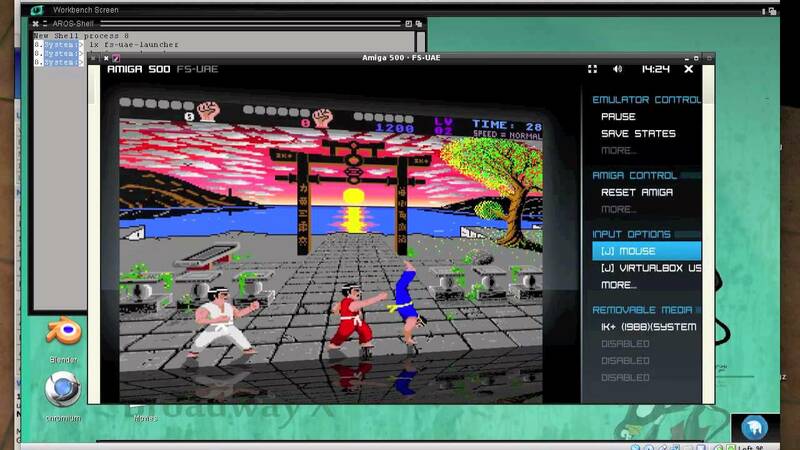 The brand (Amiga) still has a lot of power to it, so could you in theory make an Amiga based on AEROS? Since it would run on both ARM and x86, the new range could be both cheap and powerful. Is this an idea for the future or an impossibility? I thought about that and the legal situation about Amiga Hardware and Amiga like OSes is a bit strange. I am working on AEROS for Meizu MX4 and I found getting in touch with http://www.amiga.at is much easier. Commodore USA just took the risk and „did it“ and after that they came in touch with the IP owners… this is a risky manoeuvre. AmigaNX is a project by me about new technologies for Amigas (the original one) to close the gap. NX stands for NeXt Generation. The Meizu Project is to demo a AEROS powered phone which can act via docking station as you computer at home and your mobile underway. Many people are now talking about Virtual Reality. Is this something you will look into for AEROS? Thanks again for answering my questions. It is much appreciated! Anything else you want to tell the readers about AEROS and your other projects? I know many people criticized me for not finishing my projects in the past.. yep, Broadway stood still, but just because I wanted to introduce so much more which took and takes a bit of time (we are 3 guys here) and time is also needed to do paid work..
Also I know that those small bits you see are not all that interesting… it is boring infrastructure work. When the basics are done we will show you new apps and many many ports. The bonus system (Amicoins) with the honoring-system of developers and collecting will give the community a way to support developers. After apps we plan to offer also ARES hardware at a reduced price for Amicoins to support developers even further. With the feedback system donations can be made especially for specific enhancements of AROS and so on and so forth. My intention is to get the system self-running and at some point independently from my person. A sort of foundation could direct it. Don’t mix them with Amigacoins.. this is another thing. For those of you who are interested in checking out some of his projects, please head over to the homepage of AEROS by clicking here. Thanks. Nice one! 🙂 Hope you had a good read!